So this is just a word to the wise. I know I’m off to get a little piece of tape and stick it over that little web eye up there… it’s really getting tricky these days to stay safe. Just a couple of collie dogs we met in Grosmont, North Yorkshire, England one year while waiting for the train. Just look at those muddy paws! Must have been a wonderful “walkies” for them! I remember when we were thinking about changing dogs from Pyrenese to collies (when our Pyrs passed on) so we went downt to Maine to the Collie Club of Maine dog show and oh my oh my…. the sight of hundreds of collies, in all colour combinations, all in one big room was incredible. We thought we’d died and gone to heaven. Of course, it WAS a dog show so all the dogs were immaculately groomed – nothing like ours here, but that one time convinced us that collies were the dogs for us. It was like a chocoholic finding himself standing in the middle of a chocolate factory! True, Bex. I wasn’t specific enough. 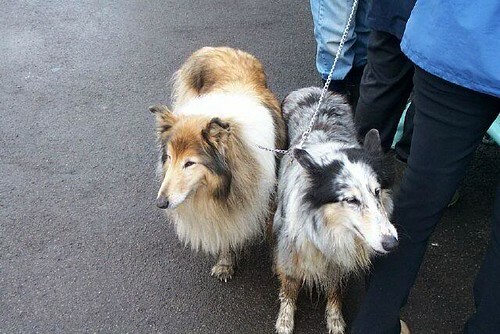 It’s the first time I’ve seen a Rough-coated Collie that’s blue merle. Wow! Very scary. What’s wrong with people! That’s the first time I’ve ever seen a blue merle Collie. So pretty! Well I am glad to know about this. I wouldn’t want some would not want some stranger peeking in on me. I like the picture of the fur kids. TS, me either. I’d never have even thought of that. I have a folded card sitting over my webcam eyeball now! Didn’t realize that was possible…Thanks, Bex!